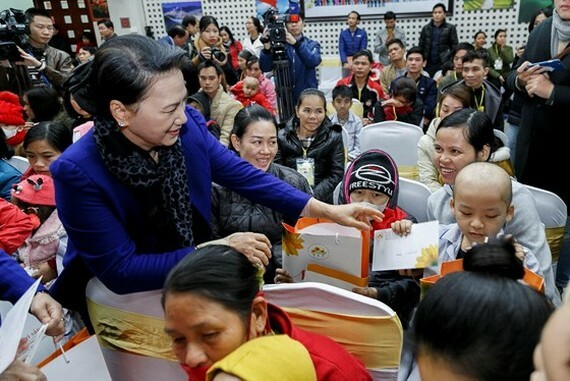 National Assembly Chairwoman Nguyen Thi Kim Ngan paid a visit and offered Tet gifts to children with cancer under treatment at the National Institute of Hematology and Blood Transfusion in Hanoi on February 5 on the occasion of the upcoming Tet (Lunar New Year). National Assembly Chairwoman Nguyen Thi Kim Ngan offered Tet gifts to children with cancer under treatment at the National Institute of Hematology and Blood Transfusion in Hanoi. NA Chairwoman Ngan handed over 100 gifts to disadvantaged child patients in the hospital. The visit is part of the charity event called Xuan yeu thuong, Tet cho benh nhan ung thu” (Spring of love, Tet for cancer patients). The charity program which was kicked off in January 27 has given 400 gifts to cancer children and 110 presents to poor cancer patients in Ha Tinh province General Hospital; more than100 gifts to poor cancer patients in Bac Ninh province General Hospital. In addition, the Supportive Fund for Cancer Patients – Bright Future will organize 20 free bus trips for disadvantaged patients to return home for the upcoming Tet holiday from 21st -25th day of the 12th lunar month. On the same day, President of the Vietnam Fatherland Front Central Committee Tran Thanh Man extended Tet greetings and presented gifts to officers and soldiers at Nhon Hung Border Guard Station in the Mekong Delta province of An Giang. He also visited and offered Tet gifts to 100 state policy beneficiary families and poor households in the districts of Tri Ton and Tinh Bien.